Letter to Next Year’s Students-Use this NO PREP writing activity with your current students at the end of the year. 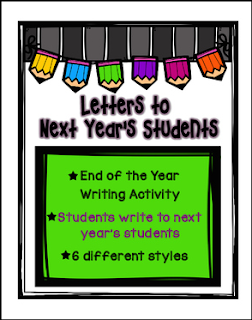 They write a letter to your (future) students for the upcoming year to tell them about some of the things they have to look forward to. They also give them a few pieces of advice to prep them for the year. It’s a fun way to welcome your new students and give them some information from the perspective of a student who has been in their shoes.